Pauline's apartment in Chevreuse which has been on long term rental, has come up for re-rental the tenants having left, etc. or forward the details to someone else who might be. 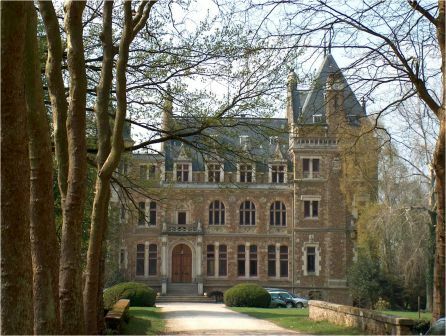 Warning: The photo above is the Castle of Meridon in Chevreuse and DEFINITELY NOT the "appartment for rent" so no law suits for misleading advertizing please ! Chevreuse is a commune in the Yvelines department in the Île-de-France region in north-central France. It is located south of Paris, in the middle of a regional natural park, Parc naturel régional de la haute vallée de Chevreuse. The Yvette river flows through the area, forming the fertile Vallée de Chevreuse. Chevreuse was founded in the 10th century, and celebrated its first millennium of existence in 1980. The evidence of such history can best be seen by the presence of a castle dating back to the same time (Château de la Madeleine). Chevreuse is serviced by the Paris Metro system (RER B line) at the Saint-Rémy-lès-Chevreuse station in the neighboring commune by the same name.